Tabloid News Review — Get the Gossip! Author The DishmasterPosted on February 15, 2014 October 30, 2018 Categories GeneralTags Bethenny Frankel, Christina Aguilera, Kanye West, Red Carpet, Simon CowellLeave a comment on Tabloid News Review — Get the Gossip! X Factor Gets Axed — Sayonara Simon! 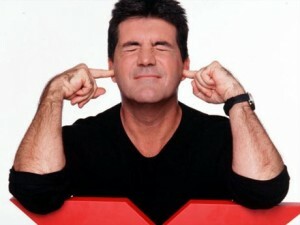 When Simon exited American Idol to launch X Factor, I assumed American Idol was doomed. I based this assumption on empirical evidence from the UK, which saw the demise of Pop Idol immediately after Cowell created X Factor, a move that ultimately resulted in a lawsuit with his former friend, Simon Fuller, who rightfully (in my opinion), claimed that Cowell stole Fuller’s format to launch his competing show. But I spoke toO soon. When I wrote my original prediction, I had yet to watch X Factor, and from the moment it began I knew it would fail in the United States. First, the format was dated. The cheesy backup dancers barely work for major stars, let alone amateurs. Additionally, Simon Cowell’s personal investment in the show skewed his objectivity, and he traded his signature barbs for sappy critiques that served only to make the show feel fraudulent. He attempted to assuage the show’s format issues with beautiful women as judges, a move that might also work more abroad than domestic. Us American’s know a sideshow when we see it, and if you don’t hire someone with inside experience, all else will fail. To be fair, he did hire L.A. Reid, but unlike Harry Connick Jr., Reid was unable to articulate the intricate issues with each contestant, therefore never fully exposing the extent of his industry experience. It’s unfortunate that X Factor failed, but with The Voice’s very fresh format and American Idol’s historical brand, it’s impossible to compete. And given Cowell’s recent popularity decline, his personality isn’t enough to save a sinking ship. That being said, I’m sure the guy is crying in a big pile of money. It was fun while it lasted. Author The DishmasterPosted on February 8, 2014 October 24, 2018 Categories General, MusicTags American Idol, Simon Cowell, X-FactorLeave a comment on X Factor Gets Axed — Sayonara Simon! If you’re feeling Claus-trophobic this evening, please take some time to peruse all the latest tabloid gossip. Your delightful dish-list is here. If you’re wondering how it’s done on X Factor, watch Paulina Rubio sing, ‘Boys Will Be Boys.’ She not only sleighed the competition, she set a new standard for every pop tart on the planet. In fact, if you watch Simon Cowell’s reaction, it’s quite possible this is the moment he fell in love with her. Here at The Dishmaster, I pride myself on my ability to pick the next big thing. And if you question my taste, just head over to my interview section and judge for yourself. Having said that, I’d like to take a moment to gloat about The X Factor’s Alex & Sierra, who I smartly singled out as the season’s front-runners on September 12th. Since no one likes a braggart, I’ve posted their most recent performance so that you can judge their future success for yourself. 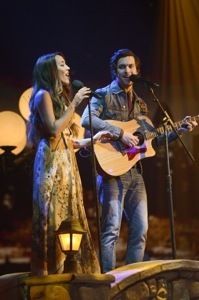 Don’t forget to read my interview with Alex & Sierra. Nicole Scherzinger and Lewis Hamilton might be getting engaged. Yahoo! Up until now, I’ve done my best to avoid listening to One Direction, who I’ve fundamentally dismissed as “just another pop fad,” courtesy of Simon Cowell. But for a brief moment in time, boredom overtook my sanity, and I watched their performance on the American Music Awards instead of fast-forwarding at my leisure. And though what I’m about to say might make you further question my sanity, I must, as always, give credit where credit is due, and compliment the boy-band, who truly moved me while singing ‘The Story of my Life.” No wonder Taylor Swift got caught up with that lead crooner. Watch below.